No time like the present for a personal career reevaluation. Enter Noah Maze. Noah graciously accepted the invitation to come teach at yogaview the first weekend of March this year. We jammed 12.5 hours of practice into 3 days and many more in discussion outside the classroom on just what is floating around out there as practice and acceptable teaching methods. This was the much needed boost for me to come up with a vision for myself for this community in Chicago and to ditch the parts of teaching that seem unauthentic to me. The change isn’t drastic, at least it shouldn’t be if you’ve been a consistent student. Every master class I’ve taken or training I’ve done with Noah has been music-free. I also always get sore from practicing with him because I do every darn thing he says. I can hear him crystal clear and I am inspired to care 110% about my dedication to the path. He holds the space with such thoughtfulness and integrity. This is what I want for YOU and for ME. The music was just one thing. Glad I got it off my chest. Years of gym yoga where it was nearly required got me hooked on making playlists. In the end, I want my postures to be more important than a playlist. Which brings up another way in which Noah’s weekend here helped me get my groove back, sequencing. Damn he’s smart. His sequences are backed up by a balance in our body’s biomechanics. It’s not willy-nilly-thought this would be a good idea and I hope it works out kind of sequencing. It’s not choreography either. He designs his sequences to make sense in our bodies. There is a focus on the poses, how to do the poses, what poses we are driving towards, and how to balance out after getting there. Many of you may have noticed I’m striving after this as well. This weekend refueled my desire to keep that in the foreground. I want to teach the poses, how to get better at the poses, and give you a balanced experience. The first session on Friday afternoon was for teachers. We revisited a typical Noah exercise- compare your pose to Iyengar’s in Light On Yoga. This gives great insight on what you are doing and what you could be doing. 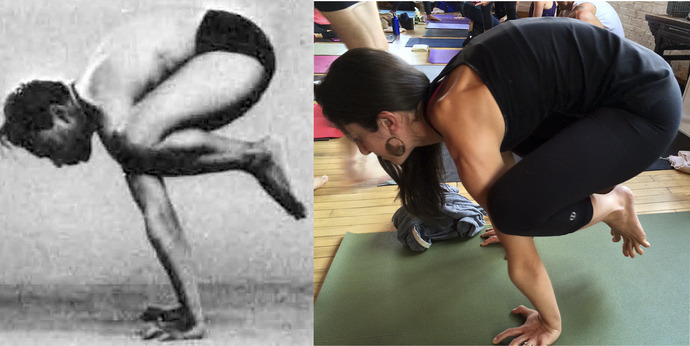 Above is the picture taken of me in class as we compared ourselves to Iyengar in Bakasana. After taking the initial photo we then worked on constructing a short sequence that would help us in achieving this particular form represented in this book (this is not the only way to do the pose and should not be misunderstood as an elitist exercise. It’s a reference tool). Then you practice your sequence and take a second photo. It’s worth your time if you are trying to become a clear teacher of forms, a student of the poses, or a physical dynamo with time on your hands. In the end it was the impetus for my week of classes following Noah’s workshops. It was also the first week of teaching in a long time that I didn’t have to try to be a personal life coach, philosophy teacher, or choreographer (much of which I gathered from getting certified in Anusara and wanted to shake like a mosquito on my back). We just did poses. And damn good poses came out of that week. There was a theme, value repetition. Short, simple, and it criss-crossed physical and psychological territory. Here’s the sequence I built off of or modified depending on the level. In Iyengar’s bakasana the midback is the highest point, the shins are level to the floor, wrists are deeply flexed with inner knee to outer upper arm.